These dogs are great family dogs. When we purchased our first one over 30 years ago my 3 sons were 10,6,and 4. The first puppy I ever sold was to a couple with a 6 month old baby who learned how to walk by grabbing the dogs fur to pull herself up. Temperament in dogs is very much an inherited trait. 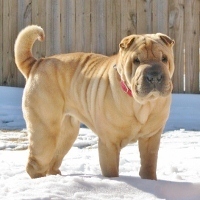 After many generations of emphasizing temperament in my breeding program, Baggins Shar-Pei have some of the most gentle and playful dispositions in this already sociable breed. In fact, my biggest problem in the show ring is that my dogs are so happy to be there and see all the other dogs and the judge that they cannot stand still - wiggling and wagging their tails and wanting to jump on the judge and give kisses. My dogs love their toys and beds so I hope she will have lots of playthings and soft cuddly beds in the rooms the family spends the most time in. I mention this as I have often been told by buyers that their previous shar-pei really did not play with anything. My puppies are introduced to toys and plenty of soft bedding from the start and they miss them. "She is gorgeous!! We absolutely adore her."